Let me be frank with you: when I was fat, I was really lazy. I hated moving around. Like a lot. Not just in terms of exercise, but in terms of just…moving. If I needed something from the other side of the room, I’d wait on someone else to get up and then ask them to get it for me. I would circle the parking lot for a spot that was literally 4 feet closer to the door than one that was already open. God forbid I ever had to park somewhere that wasn’t nearby my destination. I would even forego using the bathroom because it just took so much to pause whatever was on TV and stand up off the couch. You can guess what my stance on exercise was. I was really bad off, and I had absolutely no idea that I was as bad off as I was. Over the past few years, though, I learned an important lesson: being active has absolutely nothing to do with exercise. In fact, I had to learn to be active and to move around long before I was able to exercise regularly. If you’re struggling with exercise routines and keeping up with this or that training program, you should understand that the first step to fitness is simply moving around and being active. I don’t mean move around and be active in the typical, fitness-y sense. I mean, simply get up and do something. Walk around your living room during commercial breaks. Park further away from the store when you run errands. When you need a glass of water, go fill it up yourself instead of asking someone else to do it. Same goes for a snack. Or the remote. Or your Kindle or Nintendo DS. Whatever it is, find small ways to move around more. When I first started out trying to lose weight and become more active, I simply wouldn’t let myself ask my wife to do things for me. I wouldn’t ask her to grab something from another room, or I wouldn’t procrastinate going and grabbing my cell phone if I left it by the computer. I would just make myself get up and do what needed to be done. And because I was so big and carrying so much extra weight around, it was hard. When you weigh over 300 pounds like I did, just standing up and walking around can leave you breathless. So just a simple task like walk into the next room was enough to get my blood pumping. Over time, I wasn’t forcing myself to get up anymore. When a commercial break came on, I’d automatically go get a glass of water or something like that. Slowly, my being active and not lazy became a habit that I still keep today. The important part of living an active lifestyle isn’t how many calories you burn, what kind of foods you eat, or what workouts you do. It’s about making sure your body is able to keep moving around. Sure, being a runner means you’re likely very active. And again, sure, if you hit the gym every day, you’re probably very active. But so are the people who walk around their offices during their 15-minute breaks. So are the people with standing desks. And so are the people binge-watching House of Cards who do pushups everytime Frank Underwood talks to the camera. Because they’re moving around when they wouldn’t ordinarily be moving around. Stop thinking about living an active lifestyle in terms of workouts and exercise, and start thinking about in terms of living life. 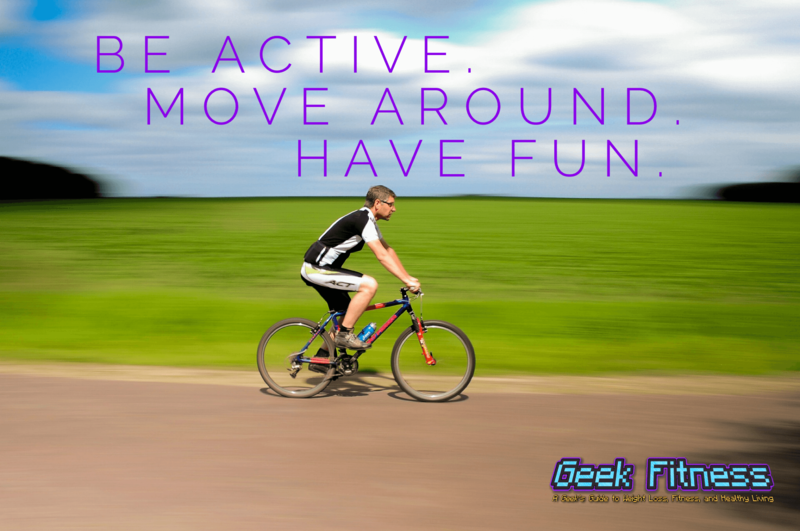 What can you do to be more active in your daily life? Great tips. I know that sometimes I hate simply moving, especially after a long day. I have a Misfit Shine that tracks my steps and that has encouraged me to keep moving! Wow, you sound like my past! I do need to move more at work and binge watching shows on Netflix. When I first started losing weight, I remember being very much about the small, daily changes. Parking farther away, taking the stairs instead of the elevator. I was in college, and I remember that when I wanted a treat of junk food, I would walk the two miles from campus to get it, rather than order in or drive. It was never anything monumental, but those small, regular actions added up over time and created the new habits. I definitely had a very rude shock at just how inactive I had become when I started using a step counter on my phone. It recommends that I should be doing 10,000 steps per day *excluding exercise*. Hahahahahaah, yeah right, I’d be lucky if I got half of that. In saying that, I was really good at making sure I just kept active when I was pregnant and my weight gain was minimal. My son’s school was just down the road so I would walk down to pick him up. The corner store was literally a 2 minute walk, so I would choose to go there instead of driving into town for supplies. It absolutely helps. But the computer chairs are so nice and easy to wheel around! I have to remind myself that at work more often than I am comfortable with. I find a marked difference in the way I feel between days where I am shackled to my desk working a solid day without moving much and days where I take multiple breaks to get up and wander around a lot. Being sedentary is a killer on both the body and the mind!